What have you planned for the Super Bowl? How about this Football Calzone: layers of pizza crust topped with pepperoni, sauce and mozzarella. It was created by Beth of HungryHappenings.com for Tablespoon.com, part of Pillsbury. Beth who says that it is “super simple” to make and recommends it as a hearty appetizerg. First, you’ll need a Wilton First And Ten Football Pan. Made for cakes, it’s also happy to bake your calzone. A calzone is essentially a “pocket pizza”: It has the same ingredients as pizza, but the crust is folded over, similar to an empanada or turnover. You also can stuff more ounces of ingredients into a calzone than you can add to a pizza crust. Although Beth doesn’t include ricotta in this recipe, we love to pile in ricotta as well as mozzarella. Prep time is 20 minutes, cook time is 20 mimutes. 1. PREHEAT the oven to 425°F. Spray a football-shaped cake pan with cooking spray. 2. UNROLL 2 pizza crusts onto baking sheets and bake for 8-10 minutes, until golden brown. Cut football shapes out of crusts, one larger than the other, which will fit inside the cake pan. Tip: First cut a football shape from parchment, check the size against the pan, and use it as a cutting template. 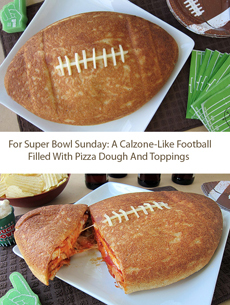 Top and middle: Football Calzone. Photos courtesy Tablespoon.com. 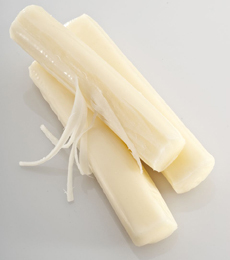 Bottom: String cheese for the football laces. Photo courtesy DaytonDailyNews.com. 3. UNROLL and drape the third tube of pizza dough over the inside of football pan. Sprinkle on 1/3 of the pepperoni, cheese, and sauce. Top with the smaller football crust. Sprinkle on 1/3 of the remaining pepperoni, cheese, and sauce. Top with larger football-shaped crust. Sprinkle on the remaining pepperoni, cheese, and sauce. 4. UNROLL and drape the fourth tube of pizza dough over top of the pan. Cut off the dough around the edge of pan and pinch the dough together along the edge. 5. BAKE for 15 minutes. Then turn the oven off, cover the calzone with foil, and leave in oven for 5 minutes. Meanwhile, cut the string cheese to create the laces of the football. 6. REMOVE the calzone from the oven and un-mold it onto a serving platter. Add “laces” of string cheese. Serve hot. HERE ARE STEP-BY-STEP PHOTOS AND INSTRUCTIONS.